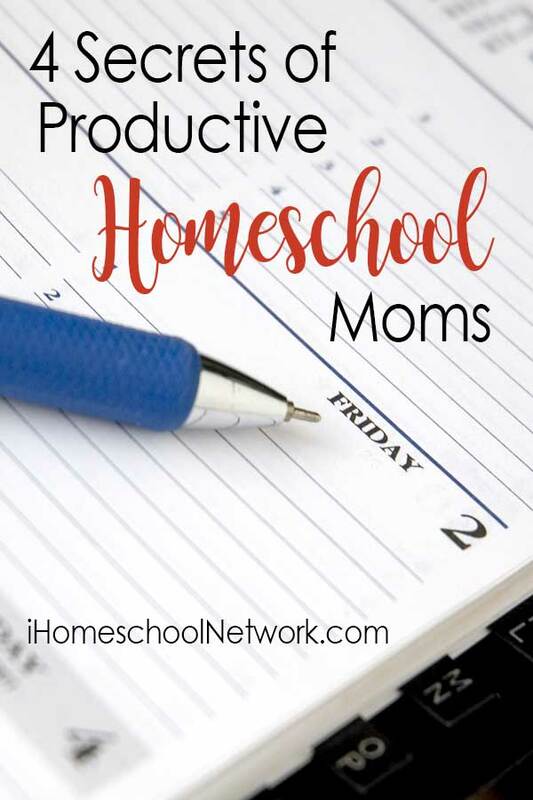 Have you ever thought, “There are simply not enough hours in the day.” As homeschooling moms, our responsibilities seem endless. Cleaning the house, making meals, changing diapers, and teaching all the things. And it is true. You can’t do everything. But you can do the most important things when you know the secrets of productive homeschool moms. One of my favorite articles about productivity is Kevin Kruse’s 15 Surprising Things Productive People Do Differently. Kruse shares 15 “secrets” that these ultra-productive people do. Although they may not all apply to homeschooling moms, I’ve discovered four of them can make a big impact on our homeschools. What is your MIT as a homeschooling mom? That sounds like an obvious question (homeschooling), but homeschooling moms have multiple important tasks. According to the season of life you are in, or even the day, the most important one may be different. Make a list of 3 important tasks each morning. And then, make sure that while doing each task, you give it your full attention. I think of this as juggling. We have to keep our eye on the ball that is in the air so that we don’t drop it. So when it comes to homeschooling, eliminate distractions as much as possible. That might be putting your cell phone in another room, or it might be shutting down your computer. For your children, they may need to work around the kitchen table instead of their rooms. Even though you can’t get rid of everything that distracts, you can choose to make simple changes that will impact both you and your children’s ability to focus. And after you do that, be fully present. The laundry can wait. The house doesn’t have to be perfectly clean. Set aside some hours each day to allow yourself to simply be your children’s teacher. There are so many good things we can do as homeschoolers, but if we say yes to every thing, we won’t have time for the most important things. Think of your family as a team. As a family you will have to decide what your priorities are and then use them as a basis for your decision making. You need to have the same goal. For example, if building family relationships is important to you all, then you may have to say no to signing your kids up to play multiple sports or be a part of a variety of groups. You’ll have to find ways to protect your family time. Knowing your priorities will help you say no to the good to save time for the best. My single greatest surprise while interviewing over 200 highly successful people was how many of them wanted to share their morning ritual with me…While I heard about a wide variety of habits, most people I interviewed nurtured their body in the morning with water, a healthy breakfast and light exercise. They nurtured their mind with meditation or prayer, inspirational reading, and journaling. If you don’t have a morning routine, you can start small. Choose three or four things that will make the biggest impact on your day and then build from there. Crystal Paine’s Make Over Your Mornings is one of my all-time favorite courses. After taking it, I really did change the way I approached my day. I NEVER considered myself to be a morning person, but after going through the class I found the motivation I had been missing. I actually enjoy mornings (most of the time) and find them to be the most productive hours of my day. And just so you know, an effective morning routine isn’t about getting up at a specific time. It’s about starting your day off right. Secret #15 in the Forbes article says that energy is everything. You can’t make more minutes in the day, but you can increase your energy which will increase your attention, focus, decision making, and overall productivity. Highly successful people don’t skip meals, sleep or breaks in the pursuit of more, more, more. 1. Eat regular, healthy meals. Healthy doesn’t have to be complicated. But it does require planning ahead. When you stock your refrigerator and pantry with healthy staples, you can have a quick healthy meal always at your fingertips. We like to keep bags of frozen vegetables, fresh vegetables, fruits, and whole grains such as brown rice and quinoa on hand. 2, Get plenty of rest. When my kids were young I had a tendency to stay up too late. So many nights I just wanted some down time without the boys constant noise. But that decision to stay up just a bit later relaxing, watching T.V., or reading wasn’t always wise. When I’m tired I tend to get a little grumpy ? So even though staying up a bit later sounded good in the moment, it meant the next day was exhausting. So Dear Mom, try to go to bed at a reasonable time. You cannot pour from an empty cup. It is not only OK to take time for yourself, it is crucial for your health. Taking care of yourself isn’t selfish. In fact, it is one of the most loving things you can do for your family. So find a hobby you enjoy, take a class and learn something new, or simply trade babysitting with a friend and go to a local coffee shop, but find ways to take care of YOU! I’m not sure we will ever feel like we have enough hours in the day as homeschooling moms. But the truth is there will never be more hours in the day. So if we want to do the things we need to do, the things that matter most, we can choose to be more productive in the hours we do have. She is also the author of the Middle School Extensions for the Trial Guide to Learning series and Content Coordinator/Social Media Manager for Homeschooling Today Magazine.